What is Virtual Network Function (VNF)? The objective of NFV along with SDN is to gain agility, dynamic scaling and flexibility in network infrastructure which are making their way to adapt technology transformation. Basically, with SDN, operators or network administrators will get full control over their network and with NFV architecture, network equipment will be replaced with Virtualized infrastructure. This virtual infrastructure would host and run Virtual Network Functions (VNFs). Hence, VNFs represent software implementation of network devices which are virtualized and packed in virtual machines which are scalable and movable. These VNFs are then hosted onto high end Commercial Off-the-Shelf (COTS) compute, storage and networking infrastructure. Multiple vendors are now offering VNFs as solution to present various network functions. Tunnelling gateway elements: IPSec/SSL VPN gateways. Traffic analysis: DPI, QoE measurement. Application-level optimisation: CDNs, load Balancers. Home routers and set top boxes. Mobile network nodes: HLR/HSS, MME, SGSN, GGSN/PDN-GW, RNC. Network-wide functions: AAA server’s policy control, charging platforms. Security functions: firewalls, intrusion detection systems, virus scanners, spam protection. Multiple individual VNFs are combined together to create single super service to run in NFV environment. This way, software in form of VNFs built for different network functions can work individually or combined together, further allowing service providers to rapidly develop and deploy new services for customers and achieve growth in revenue and be competitive in respective market. We can predict that, most of the present network infrastructures in enterprises and telecom service providers will get transformed to adopt NFV architecture and top technology vendors, network equipment vendors, mid-level network software vendors will focus towards providing products, services and solutions for VNF development, on-boarding, integration & sustenance. Here is the basic VNF functional model. 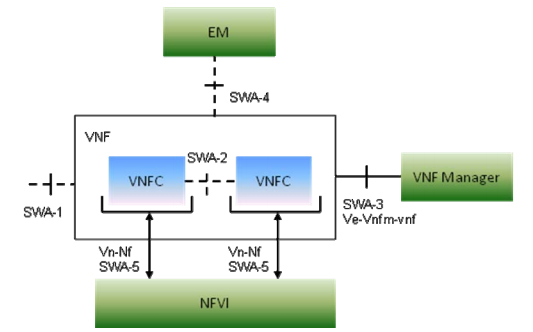 Typical VNF performs network functions on top of NFV infrastructure (NFVi). NFV orchestrator (NFVO) is responsible for orchestration of VNFs and lifecycle of VNFs are managed by dedicated VNF Manager. VNFs are software images developed to run as network function. VNF providers design software into components and VNFs are made by collectively packaging multiple software components. Software components are called VNF components (VNFCs). VNF structure made up of multiple VNFCs depends on factors like prioritization of performance, scalability, reliability, security and other non-functional goals, the integration of components from other VNF Providers, operational considerations, the existing code base, etc. VNFs are basically vendor developed software having different architecture per VNF. Their interfaces and functionalities can be improved or changed dynamically due to the need for innovation in services delivered on NFV. Every VNF have associated VNF Descriptor (VNFD) which contains post deployment & operational instructions. VNFD are used by VNFM for processes like VNF instantiation and lifecycle management in NFV infrastructure. Information in VNFD is useful for NFVO to manage and orchestrate network services and virtualized resources on NFVi. No standard protocols or configuration policies for VNF across vendors. Service providers have their own workflows in infrastructure. VNFs need to be developed to be able to integrate in infrastructure. Due to such challenges, manual efforts are needed each time to configure, update and testing for VNFs and this is one of the roadblocks for service providers to realize the NFV implementation success. Apart from above challenges there are few more obstacles related to VNFs. Like consumption of hardware resources by VNF (to be highly available) is on higher side, multi tenancy is not supported, VNFs cannot be reused or shared, APIs are not provided for automating tasks like scaling, configuring, patching and updating versions. Current innovation in software development is to make any application a cloud-native; means applications can be API driven, micro-services oriented, containerized, dynamically managed. Cloud native capabilities allow developers to build final product in no time and managing all the software components will be highly automated. Applying cloud-native capabilities will overcome many challenges which are vendors and service providers are facing. Cloud-native VNFs enables standard and simplified management of VNF components and further reduces the power consumption and frees up unnecessary allocated hardware resources as tasks are fragmented (i.e. micro-services oriented. Cloud-native VNFs enables VNF components to be easily reused and shared among NFV infrastructure. NFV architecture offers a great promise to provide agile, flexible and automated network. Most of major CSPs have started journey to 5G with power of NFV and SDN in their hand. But VNF is central part of NFV architecture and represents a major development area in NFV roadmap and it should be properly neutralized to overcome every challenge in NFV implementation. Highly automated, containerized, micro-services based and dynamically orchestrated VNFs will be a huge boost to realize NFV success.